Racist Kosciusko County Crackerjack License Cop Sgt. Jeffrey Shaw Dies With FAKE Badge On: "We are thankful for brave truck that straddled the lane." 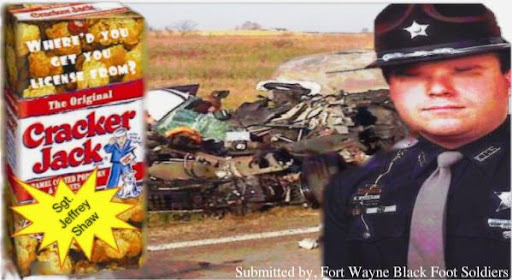 Fort Wayne Black Foot Soldiers allege their prayers and offerings to Allah against the Kosciusko County Police Department have been answered with the violent collision that resulted in death of Sgt. Jeffery Shaw, Thursday. The crash, which reportedly happened around 3 p.m., occurred just after Soldiers convened in a special afternoon prayer session.